Aaah, nothing can beat this series as far as scenery goes. 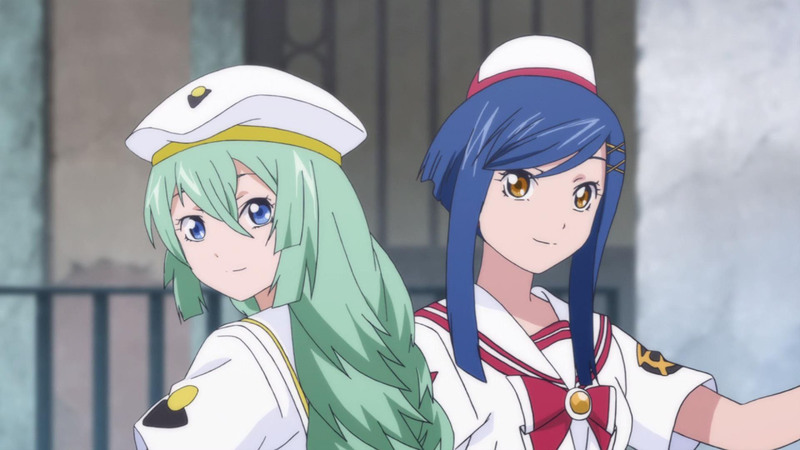 When it comes to classics, in the Slice of Life genre, you can’t go past Aria. 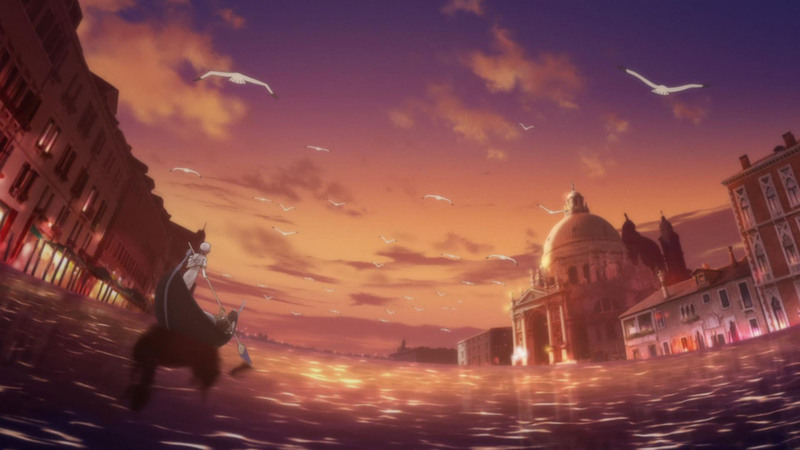 It seems odd to come into the blogging sphere so far after the main series of Aria, and its prequel, Aqua, have ended. But for me, a long time fan of this beautiful series, there is something to be said about going back to watch this OVA. It’s like getting a phone call from a long lost, but very loved, friend, after 10 years or so. Where do we begin with Aria? Well, I’ll start with the overall setting for those who don’t know of it. The world of Aria is set far into the future where Mars has been colonised. Upon melting the ice caps, the planet was flooded and thus, renamed ‘Aqua’. 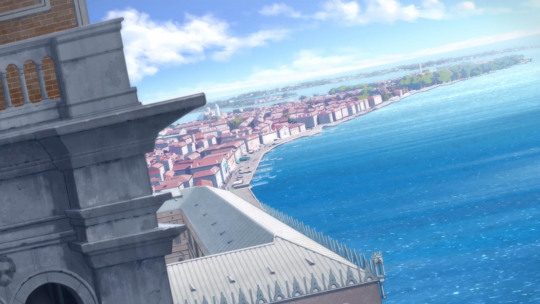 It was since terraformed and now resembles a second Earth, upon a new city based off of Venice, named Neo-Venezia, was built. As such, the gondola trade is still alive and well, and ‘Undine’ are the popular field of occupation for woman, who row the boats for tourists around town, or as a sport. The adventure revolves around Akari, a girl originally from Earth (referred to as ‘man-home’), desires to become an Undine, and joins a very small, but very famous company, called ‘Aria Company’. Following three seasons of the anime, several OVA’s, and 14 manga volumes (if you include Aqua’s two volumes), we see her become the Prima Undine she dreamed of. I’m so happy to see Alice and Aika make an appearence, too. With this new OVA, we follow Akari’s new adventure as an adult who is now leading her young student, Ai, down her own path to become a Prima. Through it, we see glimpses of how the other characters have moved on, or previous adventures not told from when Akari was younger. In this episode, we mostly re-meet Akari and Ai, as we watch them share their new lives together. We see a flashback to when Akira, the teacher of Akari’s friend Aika and her feelings about being seperated from her own trio since becoming a Prima Undine. She wishes to give Alicia (Akari’s teacher – goddamn all the A’s are driving me nuts writing it!!) a birthday present, but due to scheduling conflicts, felt she would be unable to. But, due to a ‘miracle’, she was able to do just that. It was incredibly nostalgic coming back to this show after first watching it some 7 years ago or so. It’s hard to describe an anime of such simplicity, but also such beauty, without saying ‘just go watch it and relaaaaxxx’. There will be three of these OVA’s, so I’ll be reviewing all 3. I hope you will enjoy it as much as I have.